Banksy is a divisive figure; dismissed as a huckster pedalling hipster totems to poseurs and pseuds by some, hailed as a renegade genius democratising the art world by others. Whatever your take, it is undeniable that Banksy holds a unique place in our information-saturated age. By withholding his identity he has become the world’s most fascinating and speculated-over artist, taking the consumer back to a time when every facet of a public figure’s life was not freely available at a single click, paradoxically earning greater fame and attention by stepping away from it. In cultivating this mystique, he has elevated himself above his peers and progenitors – such as the French graffiti artist Blek Le Rat, who was decades ahead of Banksy but could not break beyond the rarefied confines of the Paris cognoscenti. Typically, Banksy is not the central figure of his own film; he hovers over proceedings, passing comment on its central figure – Thierry Guetta, a French fashion store owner living in LA who obsessively films the events of his life. On a family trip to France in 1999, Guetta discovers that his cousin has become a leading figure in the nascent ‘street art’ movement, going under the name Invader. In following Invader, Guetta meets a number of other street artists, including Shepard Fairey, renowned for his Andre the Giant ‘obey’ artwork and credited with creating ‘that’ image of Barack Obama. Guetta becomes the unofficial documentarian of the movement and resolves to make the definitive documentary. But in order to do so he must track down Banksy, street art’s leading light and a global celebrity following his controversial paintings on the West Bank. Happenstance intervenes and Guetta makes contact with Banksy in LA. 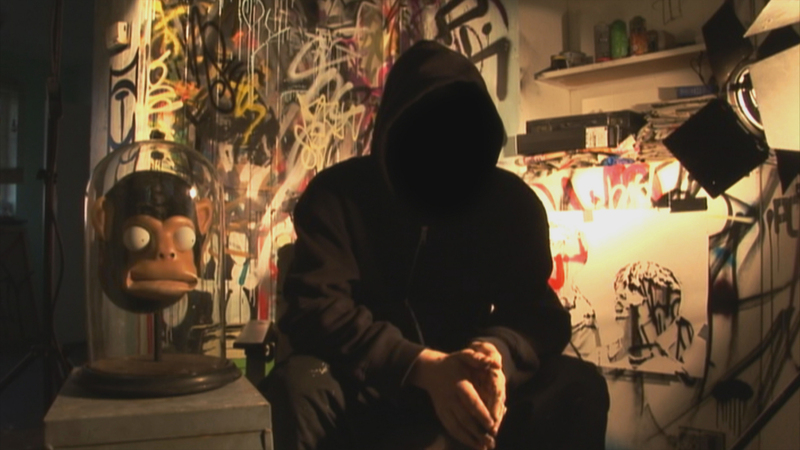 He is given unprecedented access to Banksy’s London studio as he prepares for his first US exhibition, but it soon becomes apparent to Banksy and his inner circle that Guetta doesn’t know what he’s doing. ‘Exit Through the Gift Shop’ is a paean to process, an intriguing meta-doc that both delineates the growth and co-option of a subculture and charts the passage of a guileless enthusiast swept up in its midst. It is as much a cautionary tale about the dangers of overexposure as a celebration of a bold new stylistic development. Without giving too much away, Guetta is transformed from the Pupkin-esque hero of the piece to its ultimate villain, beginning as a confidante of the burgeoning scene and ending as its betrayer, subverting the very thing he helped to nurture. The over 10,000 hours of footage shot by Guetta is assembled into a coherent arc that details street art’s transition from social menace to viable commodity. Those who indulged Guetta recount their version of events in bemused, rueful tones, no doubt aware that what began as a necessarily transient means of expression has been formalized, becoming a set of conventions to which its slew of new followers slavishly adhere. Though ‘Exit Through the Gift Shop’ is a knowing attempt to mythologize the Banksy phenomenon, it has the opposite effect, exposing the ‘magpie’ aesthetic and the paucity of ideas at its heart. By transporting their work from the streets to the gallery, the clumsy metaphor, simplistic social commentary and political grandstanding are exposed as the T-shirt sentiments they are. The ideas are too slight to survive outside their original context, where they enlivened the drab homogeneity of the modern cityscape. Ensconced in the homes of wealthy collectors and reproduced for mass consumption, they have become part of the industry hype machine, their value assessed in market terms, third-hand cultural signifiers peddled to a credulous audience seeking instant credibility. Banksy: The Obi-Wan Kenobi of wallscrawlery.